Mold, mildew, bacteria, and indoor air pollution are all serious environmental health concerns, and everyone knows that foul-smelling odors negatively impact our lives. The high oxidation potential of ozone is utilized to its greatest advantage with highly efficient 200CT-12 Ozone Air purifier developed by us. 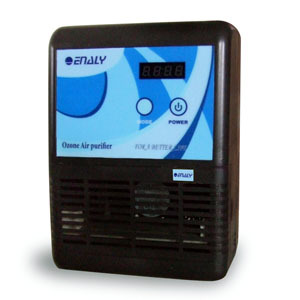 200CT-12 comes with two operating modes- Daily Purifying Mode and Unoccupied Ozone Shock Treatment Mode. Under Daily Purifying Modes, it automatically maintains a low level of ozone for safe daily air purifying, deodorization and bacteria sterilization, making the air you breathe fresher and purer. There are High; Normal; Low Daily Purifying Modes to suit various room sizes. You simply set it according to your room size and forget about it. Increase the level of ozone by selecting a stronger mode when there is constant source of contamination such as smoking. The Unoccupied Ozone Shock Treatment mode is for removing stubborn odors like smoke, mold and pet odors and for killing serious germs, mold and viruses. There are 4 Unoccupied Ozone Shock Treatment strengths to choose from and the treatment can be easily performed in an occupied room. This air purifier does not rely on air filters. It uses a near-silent Air Fan (CFM: 52) to distribute ozone gas through out the area to purify the surrounding air completely and quietly. *for bigger room, please see our 500CT-12. We offer 1-year warranty to our products. Our products are manufactured in China and will be shipped to you directly from China , so that we can pass on the savings in manufacturing to you. 1. Slim design; can be hanged on walls. 2. Push button on the body for manual operation. 5. Suitable for both daily air purifying and unoccupied ozone shock treatment. 6. Neutralizes stale and foul odors rapidly.